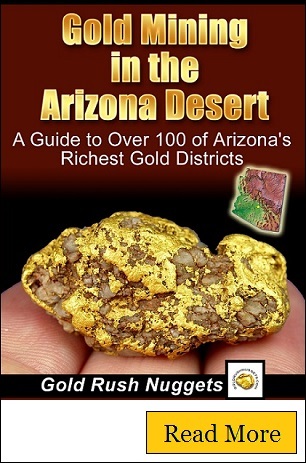 Located on the eastern side of the White Hills in Mohave County, the Gold Basin District is one of the many rich gold bearing areas in the state of Arizona. With hills that are primarily made up of granitic, volcanic and schistose rocks, there have been plenty of gold veins discovered in the region. Due to the high prices of gold today, this area is still attracting plenty of attention. With the first discoveries of gold in the area were made around the 1870s, but discoveries by Depression era miners in the 1930s brought renewed interest to Gold Basin. Limited water meant that miners mainly used drywashers to recover the gold. Interestingly enough, the area is now just as known for meteorite discoveries. There are many meteorites that scattered all around Gold Basin, and it is not uncommon for people to find them using metal detectors while searching for gold nuggets. In the early years after the Civil War when gold was first discovered, load mining techniques were difficult because of the lack of water and the difficulty and remoteness of the terrain. This meant that normal mining operations were not practical and it wasn’t until the OK Mine started pumping water from the Hualapai Valley that a practical method of processing all that ore was possible. Before that, miners proceeded as best they could with the tools they had, but it was still very limiting. However, the addition of water pumped into the area made it possible to mine for more gold more efficiently than was possible using dry methods. The Gold Basin itself stretches for about six miles in length from the White Hills where the gold originates to the Hualapai Wash and is around five miles in width. The gold itself comes from many smaller veins imbedded with quartz which are found in the metamorphic rocks in the area. The gold can be found in both lode and placer forms which makes many different forms of mining possible in the area. Most small-scale miners in this area today use drywashers and metal detectors to search for gold nuggets here. The placer gold is spread out along the floor of the basin itself and is mostly found in the rocky outcroppings where the gold no doubt collected many years ago as it was washed off the White Hills. A trained eye can identify these areas where placer gold gets caught up in the jagged rocks and work these areas with much success. The two most prominent mines in the region are the El Dorado and OK Mines which have produced quite a bit of gold over the years. Founded in the late 1870s, the El Dorado Mine actively produced 26,000 tons of ore from its beginnings until the mine was finally closed in 1940. The OK Mine was founded in the early 1880s and produced $25,000 worth of gold until it was destroyed by fire in 1906. There is still a lot of active mining taking place in Gold Basin, especially during the winter months due to its wonderful climate.